Stands of river bottom, old growth white spruce dominate the landscape of Dall River Old Growth Park. This remote park is situated in the Cassiar Mountains and is home to a variety of wildlife species. Horseback riding, hiking and fishing are just some activities to lure the backcountry adventurer. Water sources in the backcountry may carry giardia or other parasites. Boil or filter all water when in the backcountry. Please remember that this is bear country. These animals are powerful, unpredictable and extremely dangerous. This remote park is located adjacent to Denetiah Park, along the Dall River downstream from Dall Lake. It is approximately 300 km west of Fort Nelson. There are no roads; access to the area is by air. Most visitors to the area are members of guided hunting and/or fishing trips. Cultural Heritage: Dall River Old Growth Park overlaps with traditional use areas of the Kaska Dena and Tahltan First Nations. The park holds significant spiritual value for First Nations. Although there is limited documented information, the area has high potential for cultural and heritage resources. Conservation: Dall River Old Growth Park lies west of the Rocky Mountain Trench and falls within the Cassiar Ranges ecosection. 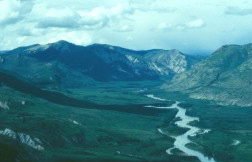 The park encompasses the valley bottom of the Dall River, downstream from Dall Lake.One biogeoclimatic zone, Boreal White and Black Spruce, occurs in the park. The forested valley of this section of the Dall River contains extensive stands of old growth white spruce. Flowers, trees and shrubs are part of the park’s natural heritage, please don’t damage or remove them. Wildlife: The park contains important habitat for grizzly bear and furbearers. Stone sheep are common outside of the park in the rugged mountainous alpine valleys that drain into Dall River. Bull trout, arctic grayling, whitefish and northern pike can be found in the clear, blue waters of Dall River. Park users should always be aware of bears and other wildlife in our park environment. Never feed or approach bears or other wildlife. For more information on bear safety, click here. There is no online management planning available. There are remote, wilderness canoeing or kayaking opportunities at this park. If in the area, anglers can try their luck for bull trout, arctic grayling, whitefish and northern pike. Anyone fishing or angling in British Columbia must have an appropriate licence. Dall River Old Growth Park provides excellent opportunities for backcountry horseback riding. Riders should be experienced and prepared for wilderness travel, as there are no designated trails.